Make Products for a Circular Economy - 1497531932s Webseite! Within the sustainablySMART project, the Austrian project partners Speech Processing Solution and the research team ECODESIGN from the Vienna University of Technology developed a new product concept for a Digital Voice Recorder based on the principles of Circular Economy. The digital voice recorder is typically used for professional dictation in hospitals or by lawyers. 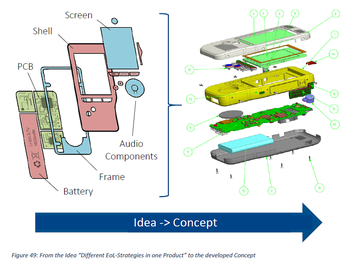 The Product Concept: The lifetime of the different components of a voice recorder differ quite a bit, while the printed circuit board could serve up to 3 product lifetimes, the housing cannot. As such different strategies need to be applied once the product is exchanges. The housing should be designed for recycling and the PCB should be designed for remanufacturing. In order to enable the distinction of the different end of life strategies in the new product concept components with the same end of life strategy (recycling, reuse and remanufacturing) are bundled into modules. The modules are designed for easy dismantling from the product and are optimised for the corresponding end of life strategy. The Business model: One of the major difficulties in Circular Economy is to get access to the used products as a source of valuable modules, parts or materials. Through a new business model, a rental concept, a simple product take-back is possible. It enables to extend the lifetime of the whole product, the lifetime of different modules and it supports efficient material recycling. This leads to a 35% reduction of the environmental impacts. In other words within three product cycles the environmental impact of one entire product can be substituted. Next to the environmental gains the economic analysis shows that the refurbishing or updating of used devices leads to an economic advantage e.g. as the refurbished device costs only 70% of a newly produced digital voice recorder (inclusive shipping costs for take back…) or as new customer segments can be targeted. It can be highlighted even if the product is designed for circular economy it will not automatically lead to a reduced environmental impact, it also needs a suitable business model, where the product can be taken back easily, where the full environmental and also economic gains can be utilised. viably because of the high costs associated with outsourcing design and manufacture of computers, which makes small-scale, localized design, production and marketing of innovative computers financially unviable. The prototype of a D4R tablet computer developed now in sustainablySMART demonstrates the feasibility of design and manufacture within a small digital fabrication workshop environment or FabLab. This design and manufacture approach will enable the financially viable commercialization of the iameco D4R tablet for a potentially growing market, starting from small numbers but building up to significant international sales. 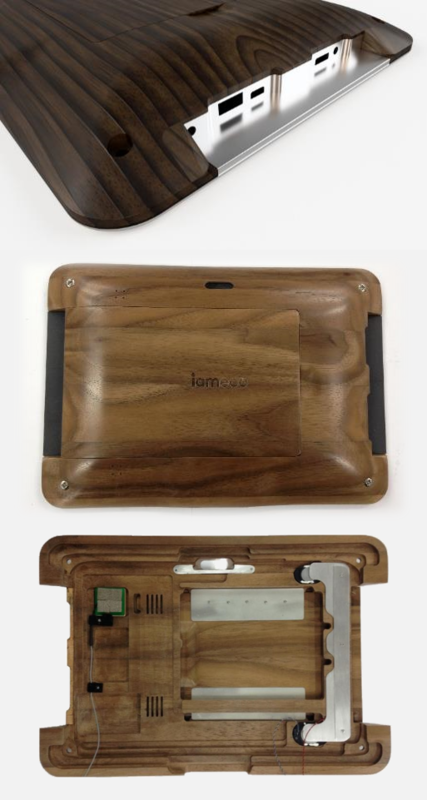 The third iteration of development of the iameco D4R tablet was aimed at adapting previous prototype designs to manufacture in a local digital design and manufacture facility (FabLab equivalent), specifically the workshop of the National College of Furniture Design in GMIT Letterfrack. The prototype will be presented at the Going Green - CARE Innovation conference in Vienna, November 26-29, 2018. Designing sustainable technologies, products and policies: from science to innovation. The following poster was presented at the 8th LCM Conference 2017 in Luxembourg! The sustainablySMART project presents the first results on the development of ecofriendly PCB embedding technologies toward advanced electronic modularization and miniaturization. It focuses on the further development of embedding technologies deploying accurate “face-down” assembly techniques, lamination in epoxy prepreg layers and state-of-the-art PCB processes for the breakdown of complex electronic systems in functional modules with discrete functionalities that can be at the end assembled flexibly with non-permanent interconnection techniques on the mainboard. These embedding technologies offer the advantage of the heterogeneous integration of components - with different functionalities, thicknesses and already existing in the market as pre-packaged components with solder terminations (e.g BGA, CSP) - in the inner layer of PCBs as assembled components and then the redistribution of their signals in the outer layers through copper electroplated microvias and drilled through vias. Based on this concept, a digital voice recorder (DVR) has been split in base and functional modules. The new designs of the USB, power, and DSP modules will be presented and the manufacturing processes and results of the digital signal processing (DSP) module will be discussed in detail. The sustainablySMART project demonstrates miniaturized DSP modules, 15mmx15mmx2.8mm comprising 68 components with DSP and quartz crystals to be embedded and flash memory and passives to be assembled as SMT components on top. The creation of such modules with the right adjustment of their termination pads will lead to a reduction of the backbone from 6 to 4 or even 2 layers with a conspicuous positive economic and environmental impact. Part III of Circular Device’s video series about the evolution of the PuzzlePhone shows some early achievements in the sustainablySMART project and shares insights in Grant4Com’s test lab environment in Oulu, Finland. Antenna simulations and testing are crucial to smartphone developments and particularly challenging for modular devices.